The Portuguese name for this breed is “Perdigueiro Português,” derived from “perdigon,” the Portuguese word for “partridge.” The Portuguese Pointer is probably descended from the dogs used by Portuguese falconers in the fifth and sixth centuries. Portuguese Pointers were described in a 12th century Portuguese book of hunting by Joao I, and appear in the 13th century paintings of Alfonso III. The Portuguese were a great seafaring people and it is quite likely that this well-established breed influenced the development of a number of European gun dogs. The breed was introduced to England where its influence can still be seen in the English Pointer. The Portuguese Pointer was recognized by the United Kennel Club on January 1, 1996. The Portuguese Pointer is a medium-sized, well-balanced dog with a distinctive “square” face, drop ears, and a tail that is carried pendant when the dog is standing and level with the back or slightly above when the dog is moving. 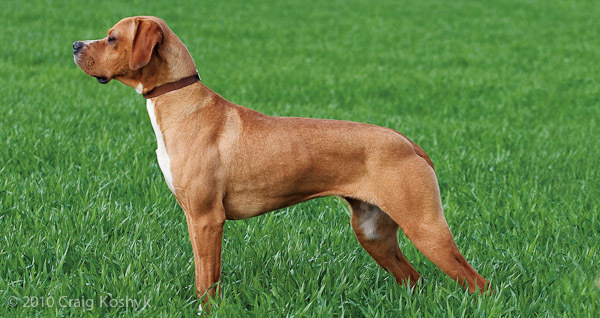 The body of the Portuguese Pointer is almost square. The Portuguese Pointer should be evaluated as a working gun dog and exaggerations or faults should be penalized in proportion to how much they interfere with the dog’s ability to work. The Portuguese Pointer has strong hunting instincts. In the field, the Portuguese Pointer is a tenacious hunter in all sorts of terrain and climate. The dog’s affectionate nature is so intense that the Portuguese standard describes it as “…occasionally even embarrassing”. This devotion, however, makes the Portuguese a joy in the field because no dog delights more in sharing the hunt with its master. The head is free of wrinkles; however, if there are wrinkles, they should only be slightly developed. It should be proportional to the size of the dog, yet by its shape give the impression of being larger. Viewed from the front, the head gives the impression of being square. Viewed from the side it is rectangular, and the stop is abrupt, forming an angle of about 100 degrees between the line of the muzzle and the line of the forehead. There is a slight median furrow between the eyes at the forehead and the occipital bone is not conspicuous. The skull is broad and slightly arched in profile. Viewed from the front, the forehead is high, wide, and almost flat. In profile, the muzzle is deep and the bridge of the muzzle is straight. Viewed from above, the muzzle is wide from stop to tip. Lips are slightly pendent but not overly thick. The top lip should fall naturally over the lower without folds, which results in slightly drooping corners of the mouth, and gives a square appearance to the muzzle when viewed from the side. The Portuguese Pointer as a complete set of evenly spaced, white teeth that meet in a scissors bite. The nose leather is black on dogs with chamois or similar color coats, and brown on dogs with brown coats. Nostrils must be large and open. Disqualification: Unpigmented or irregularly pigmented nose. The eyes are large, oval, and brown in color. Darker shades are preferred. They are set close to the surface and on a horizontal axis. Eyelids are tight, with pigment to match the nose color. The bony arches over the eyes are well defined but should not be so excessive as to make the skull appear coarse or bony. Expression is bright and intelligent. The ears are drop, medium in length (no more than six inches) and set on high. They should be approximately 2½ times wider at the base than the tip, which is rounded. The ear leather is thin and the outer side is covered with short, silky hair. At rest, the ears should hang nearly flat and close to the cheeks. When the dog is alert, the ears will roll forward and may show one or two lengthwise furrows. The neck is somewhat long, with the upper third slightly arched and with a short dewlap along the underside. It should not be so thick as to appear coarse. The neck blends smoothly into well-laid-back shoulders. The shoulders are a little loaded. The shoulder blades are long and well laid back. The upper arm appears to be equal in length to the shoulder blade and joins it at an apparent right angle. The elbows are separated from the chest by the armpit and are well let down. The forelegs are long, straight, strong and sturdy in bone, with broad, slightly sloping pasterns. The body is just slightly longer (measured from prosternum to point of buttocks) than tall (measured from the withers to the ground). The length of the front leg (measured from point of elbow to the ground) equals slightly more than one-half of the dog’s height. The back is short, strong, and straight with only a slight downward slope from the withers to the root of the tail. The loin is well-muscled, rather wide, short, and slightly arched. The croup is slightly sloping. The ribs extend well back and are well sprung out from the spine, then curving down and inward. The forechest extends in a shallow oval shape in front of the forelegs. The chest is deep, reaching to the elbows, and of moderate width. The deepest part of the chest is just behind the elbows. Tuck-up is apparent but not exaggerated. Flank is short and well filled out. The hindquarters are strong and well-muscled. The angulation of the hindquarters is in balance with the angulation of the forequarters. The stifles are slightly below the abdomen and slightly turned outward. The hocks are clean, broad and thick. When the dog is standing, the short, strong rear pasterns are perpendicular to the ground and, viewed from the rear, parallel to one another. Disqualification: Presence of rear dewclaws. Feet are compact, well-knit, and round to oval in shape rather than long but not like cat feet. Toes are tight. Pads are thick, hard and covered with blackish skin. Nails are hard and preferably black. The tail is a natural extension of the topline and is generally docked by one-third. When undocked, it must not go beyond the hock, or preferably not reach it. The tail is strong at the base, tapering gradually but not too much, towards the tip. When the dog is relaxed, the tail hangs down naturally. When the dog is moving or alert, the tail is carried level with the back or only slightly above level. When hunting, the tail may wag laterally. The tail should never be carried vertically, curled over the back or between the legs. Disqualification: Complete lack of tail. The coat is short and flat-lying. On the back, the coat is dense and somewhat coarse to the touch. From the back to the abdomen the coat texture and density changes gradually so that the coat under the elbows, in the groin, and inner thighs is less dense and softer. The hair on the head is very short, fine, and soft, and even more so on the ears, which should feel velvety to the touch. Color may be any shade of yellow or brown, either solid or with white markings. Desirable height at maturity for males is 22 inches; and for females, 20½ inches, with an allowable variation of 1½ inches either way. Desirable weight for a male in working condition is 51½ pounds (44 and 59½ pounds), and 42 pounds (35 and 48½ pounds) for a female. When trotting, the gait is effortless, smooth, powerful and well coordinated, showing good but not exaggerated reach in front and drive behind. Males under 20½ inches or over 23½ inches. Females under 19 inches or over 22 inches. Unpigmented or irregularly pigmented nose. Complete lack of tail. Long coat.